I know I have been a terrible blogger lately. I have had quite a bit going on and sometimes it's not always easy to write here. After my sister Jamie didn't come back to Tennessee with me I had a really hard time trying to understand all that happened with her. I am still struggling and heartbroken about it especially now knowing how long she may be in prison. We spent last week at some of our favorite people's cabin in the mountains in Georgia. It was such a nice relaxing week. It did rain the whole time we were there but that didn't stop us from enjoying ourselves. 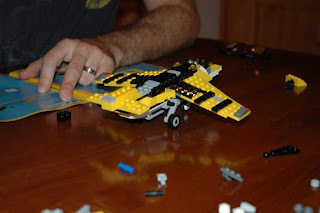 I did take a few pics of what we were up to. 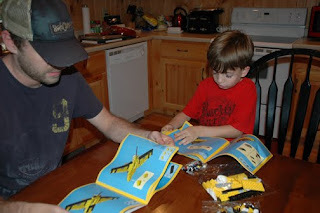 Here are some of Jared and Andon putting together a Lego airplane. 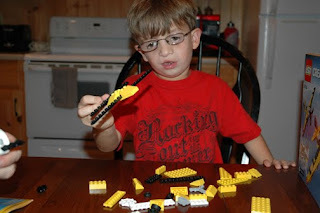 Andon made a small one while Daddy was making the big one. We spent a lot of our time at the different creeks and rivers nearby. 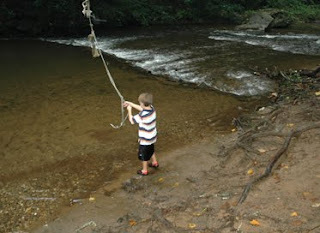 One of the places we stopped had a rope swing that we couldn't get Andon off of. 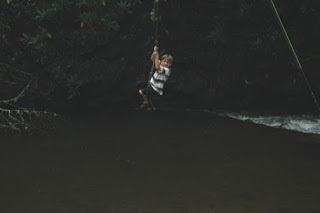 He loved swinging out over the river. 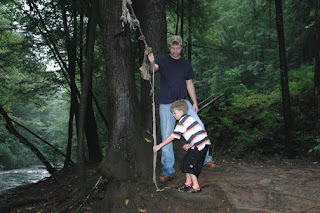 I decided to do it also and as soon as I left the land the rope came out from under my foot and I was just hanging on! I had to hold onto this knot while I swung way out over the river and back. Needless to say I didn't do it again! 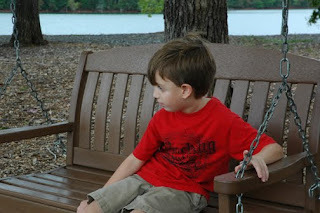 :) Here is my little guy on the swing. Now we're back home and have company once again. My other sister Jodie called us a few weeks ago and asked if she and her kids could come and stay with us for a little while. She is going through some really hard things and we are trying to help her through this. Please pray for her. I do have some fun pics to come of the kids. My sister has a 5 year old boy and a 1 year old little girl. Andon is loving having them here! We got a fun idea from my creative friend Brittani to go on an ABC Mall scavenger hunt. The boys loved it and I took tons of pics to post here soon. Can you please tell me what na ABC Mall Scavenger Hunt consists of?